Understanding how proteins function is an essential part of many biological research endeavors. The complexity and sheer number of proteins in a cell are impediments to identifying proteins of interest or purifying proteins for function and structure analysis. Thus, reducing the complexity of a protein sample or in some cases purifying a protein to homogeneity is necessary. The latest manual in the Basic Methods series contains a collection of convenient and easy to use protein purification protocols along with a sampling of dependable methods for assessing protein–protein interactions. The protocols are supported by background information to assist researchers in understanding how the purification methods work and how to optimize and troubleshoot the methods. 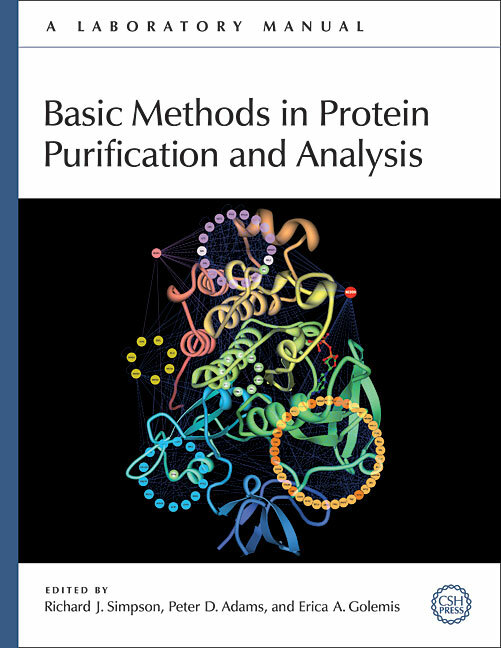 The collection of essential methods found in Basic Methods in Protein Purification and Analysis is mainly drawn from the popular manuals Proteins and Proteomics, Purifying Proteins for Proteomics, and Protein–Protein Interactions, 2nd Ed. In addition to protocols for purification using gel electrophoresis and column chromatography, this book contains tested methods for preparing cellular and subcellular extracts–a critical and often neglected step in successful protein purification. Rounding out the manual are methods for characterizing protein–protein interactions, an extensive appendix of essential methods for quantifying protein concentration, stabilizing and storing proteins, concentrating proteins, and immunoblotting. Finally, there is a new chapter on a method complementary to gel electrophoresis and chromatography: in silico analysis of genomic and proteomic databases.